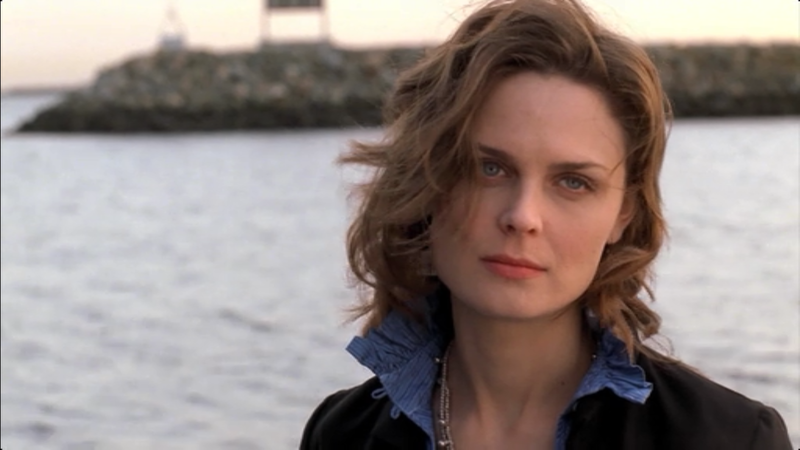 “The Boneless Bride in the River” is the first Bones episode I ever watched, and I knew even then that anyone who came between Booth and Brennan wouldn’t last too long. Ahoy the boat. Sully’s a great guy, as he should be. Brennan deserves a great guy, and it’s such a cop out to put characters in relationships with terrible people. It’s so much more interesting to put them in relationships with really good people who just don’t turn out to be the right ones. What pulls Brennan to Booth is even stronger than what pulls her to Sully. You can love a lot of people in this world, but there’s only one person you love the most. I like when Sully asks Brennan to come with him and then asks if she wants to hug. It’s kind of adorable. They’ve slept together in probably every bed they own, but he knows that this is different. He can’t just initiate physical contact now, not after he’s essentially asked her to either leave her job or lose yet another person she cares about. Brennan does not open up easily, but she’s opened up to Sully, and now she might lose him again. So he asks instead of just hugging, which is very intuitive and respectful of him. For a second Brennan looks like she wants him to shove that hug somewhere, but instead she grabs him and holds on for a while. This can’t end without her losing something. Booth wants Brennan to stay but tells her to go. She’s got to live wide, and he’s been told his life isn’t as wide as Sully’s. 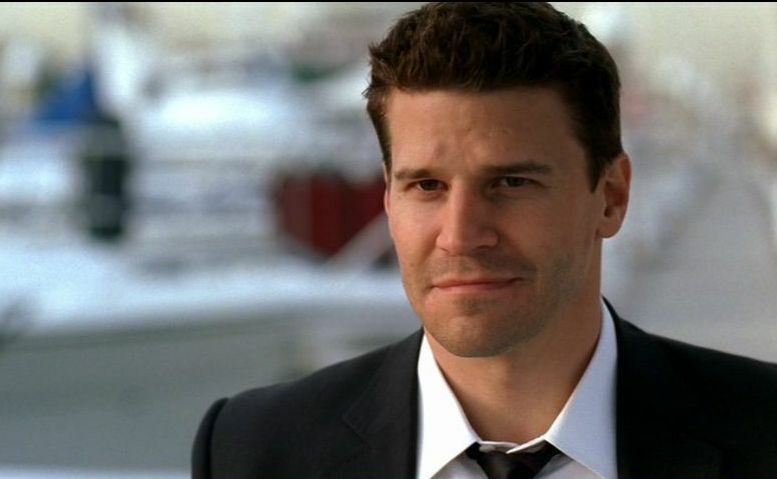 Booth is a romantic of a narrow kind—he lives to catch bad guys. That’s how he likes it, but he doesn’t want to limit her. Poor sweet puppy dog Booth. He’s never felt good enough. How could he believe that the life he leads is big enough for someone like Brennan? But look at her face, how lost she looks at the thought of not working with him. She doesn’t want him to want her to go. I think that’s when she decides to stay, in that split second when Booth tells her that she shouldn’t. Everyone’s telling her to go sail warm oceans with a man who loves her. It’s the only logical thing to do, and Brennan always does what’s logical. But everything in her is screaming that she just can’t leave this life. 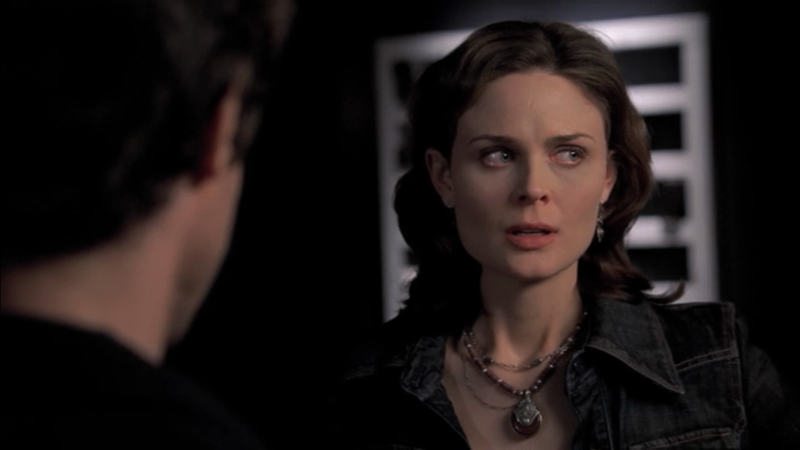 When he asks Brennan what’s holding her here, her eyes flick to Booth. She might not be able to admit it yet, but she stays for him. She stays for the man who looks for her in a one way mirror just to give her a thumbs up, because he’s so excited that they caught another killer together. Booth gives Brennan a purpose she didn’t have before. As an anthropologist, she never got involved in the worlds she studied. Booth makes her want to get involved, because no study could ever be more important than the lives of these two young people who died too soon. Angela literally drew these kids a wedding portrait just because she cares so much. That’s the kind of life Brennan leads now, and Booth makes it possible. Sully wants Brennan to live for more than dead bodies. He doesn’t want murder to be her whole life. But with Booth, it never is. Booth gives her love and respect and a partnership that goes so far beyond work, but she still gets work too. What they do matters just as much to Booth as it does to Brennan. They’re both romantics of a narrow kind. She gives victims back their faces, says their names out loud, and returns them to their loved ones. He arrests the bad guys. Everything about them just fits. Even their pain fits. They’ve both seen their families fall apart. They’ve both been abandoned by people they love. And now Brennan has to stand on a dock and wave goodbye to Sully and feel alone again. Just when things are starting to get sappy, this happens. Booth’s been there the whole time, just watching, waiting for her to notice him so he can put his arm around her. If that’s not a summary of the entire show, then I don’t know what is. Look at his face and tell me that’s not the face of a man in love. Look at this jerk. Is it possible to be totally turned on, totally amused, and also kind of want to punch someone in the face? Brennan’s having none of your charm smile today, Booth. But also thanks for coming and please stay forever. That’s the point, really: that he’s staying with her forever. That’s what they both need right now. Booth thought he was going to lose her to Sully, and he didn’t, and he’s so happy about it that he’s making terrible jokes. Oh you’re “waving goodbye,” Booth? Really? Is that what you’re doing? Nobody believes you. Brennan doesn’t really fight it, though, because she’s glad to have him too. She doesn’t want to be alone. She needs to believe that there’s one person out there who won’t leave her, and Booth needs to believe that he’s worth staying for. Every time Brennan chooses to be with him, he sees a little opening. He steps just a little bit closer and gives her some little piece of encouragement. Today, it’s breakfast (actually it’s usually breakfast, which is one of the things I love about them). EVERYTHING. Do you hear the hope in her voice? Do you hear the confidence in his? She wants to know that everything will happen for her—every possibility she just lost with Sully. And right now, with his arm around her, Booth is sure that it will. B&B turn waiting into something dynamic. It’s a choice, a conscious decision to be the one who’s not going anywhere. It hurts. But if we wait for each other actively, we’ll get there. Everything happens eventually. And eventually just happens to be tonight. Thank you! Absolutely no making fun from me. I’ll be crying on my couch tonight, and my roommates will just have to deal. YES! I wouldn’t have it any other way. Yay! I’m so glad you support my ridiculous television habits. So much more fun with company! Brennan would have left Sully at the first port of call. Part of her attraction to Booth is his seriousness about the work. Sully’s Peter Pan attitude would have been terribly grating to someone like Brennan over time. 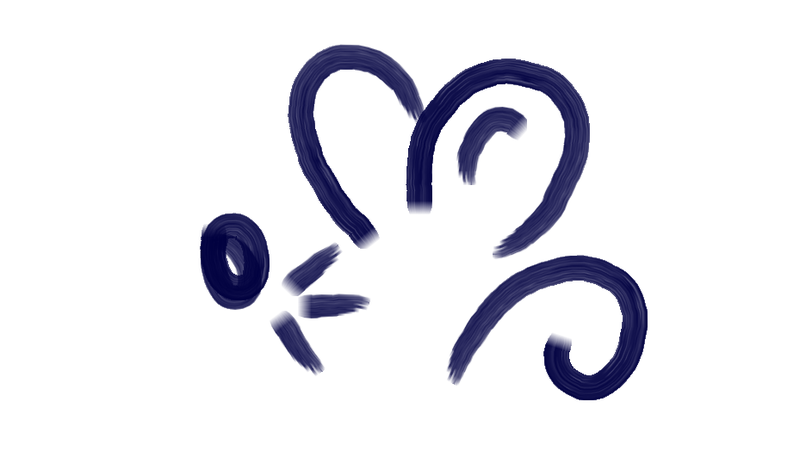 And with nothing to do she would have floundered. And besides Sully was never anything more than a watered down imitation of Booth, who was going through a nervous breakdown with GordonGordon while Brennan was pursuing Sully. Glad his time was short.